The Philadelphia Flyers announced that they have acquired 6’1”, 205-pound right wing Joffrey Lupul (JAWF-ree LOO-puhl) and 6’3”, 215-pound defenseman Jason Smith from the Edmonton Oilers in exchange for defenseman Joni Pitkanen, left wing Geoff Sanderson and a third round pick in the 2009 NHL Entry Draft, according General Manager Paul Holmgren. Lupul, 23, recorded 16 goals and 12 assists for 28 points and 45 penalty minutes in 81 regular season games for the Oilers last season. He was tied for second on the team in goals with 16. He was acquired by Edmonton, along with Ladislav Smid, a first round pick in the 2007 NHL Entry Draft, a second round pick in the 2008 NHL Entry Draft and future considerations from Anaheim in exchange for Chris Pronger on July 3, 2006. 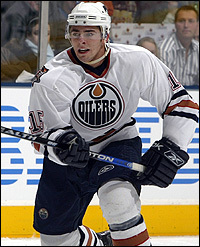 In three NHL seasons with Anaheim and Edmonton (2003-04 through 2006-07), Lupul has registered 57 goals and 58 assists for 115 points and 121 penalty minutes in 237 regular season games. He set career highs for goals (28), assists (25) and points (53) in a season with Anaheim during the 2005-06 season. He was originally drafted by Anaheim in the first round (seventh overall) of the 2002 NHL Entry Draft. Smith, 33, posted 11 points (2G,9A) and 103 penalty minutes in 82 regular season games for Edmonton last season. He led the team in blocked shots (228, second in the NHL) and hits (151). 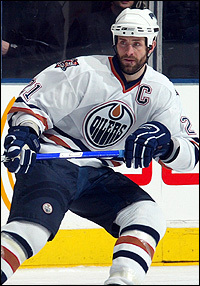 Smith, the Oilers’ captain, had led the Oilers in hits and blocked shots in each of the last five seasons that the statistics have been recorded by the NHL (1999-2000 through 2001-02 and 2005-06 through 2006-07). He was third on the team in penalty minutes with 103. Over parts of 13 career NHL seasons with the New Jersey Devils, Toronto Maple Leafs and Edmonton (1993-94 through 2006-07), Smith has recorded 39 goals and 119 assists for 158 points and 966 penalty minutes in 868 regular season games. He was originally drafted by New Jersey in the first round (18th overall) of the 1992 NHL Entry Draft. Pitkanen, 23, registered four goals and 39 assists for 43 points and 88 penalty minutes in 77 regular season games for the Flyers last season. In three career NHL seasons, all with the Flyers, (2003-04 through 2006-07), Pitkanen recorded 25 goals and 91 assists for 116 points and 210 penalty minutes in 206 regular season games. He was drafted by the Flyers in the first round (fourth overall) of the 2002 NHL Entry Draft. Sanderson, 35, posted 29 points (11G,18A) and 44 penalty minutes in 58 regular season games for the Flyers last season, his only season as a Flyer. He was signed as a free agent by the Flyers on July 19, 2006. Over parts of 16 career NHL seasons, Sanderson has registered 352 goals and 335 assists for 687 points and 495 penalty minutes in 1,063 regular season games.